NAVARCH (1897) The 494 ton steam whaling bark Navarch was caught in the pack ice off Icy Cape in late July 1897 and abandoned off Blossom Shoals August 12, 1897. The vessel departed San Francisco March 2, 1897 for whaling in the Arctic with thirty two crewmen aboard. Sixteen of her crew perished in the attempt to reach shore over the ice. 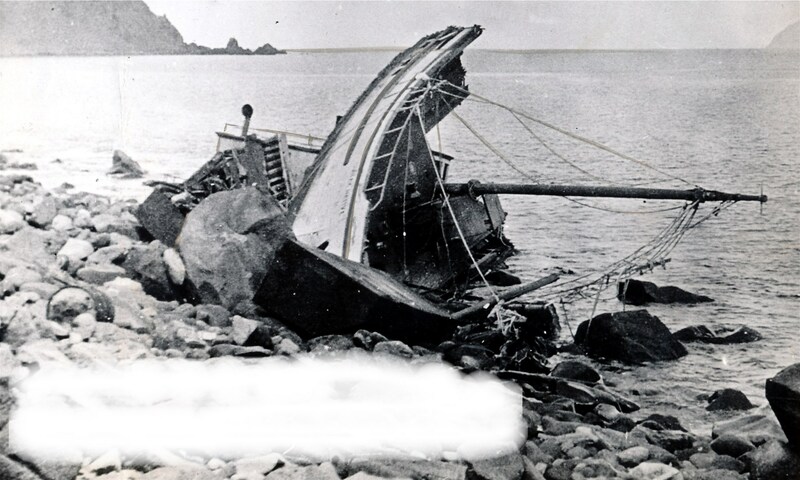 The other half of the crew were rescued by the cutter Bear and steamer Thrasher along with shipwrecked crewmembers from eight other whaling vessel of a similar fate. The Navarch drifted in the ice and reached the Pt Barrow area where her supplies helped the shipwrecked crews there survive. She was eventually “set on fire by salvers” in January of 1898. The Navarch was valued at $100,000 with cargo. NAVY (1871) The 385 ton wooden whaling bark Navy was abandoned in the ice near Point Belcher September 14, 1871. Her home port was New Bedford, Massachusetts and her value at the time of the disaster was $55,000. NORTH STAR (1882) The 489 ton steam bark North Star was crushed in the ice two and a half miles from shore at Point Barrow July 8, 1882. She was on her maiden voyage out of New Bedford, having departed August 2, 1881 for whaling in the Arctic. The force of ice was so great that her timbers cracking could be heard on shore. The crew made it over the ice to the U S Army Signal Service Station.